We cooks are all very theatrical performers. Many of us love to croon, rap, tap dance, leap, hum or belt out full-on operatics while we create in the kitchen. 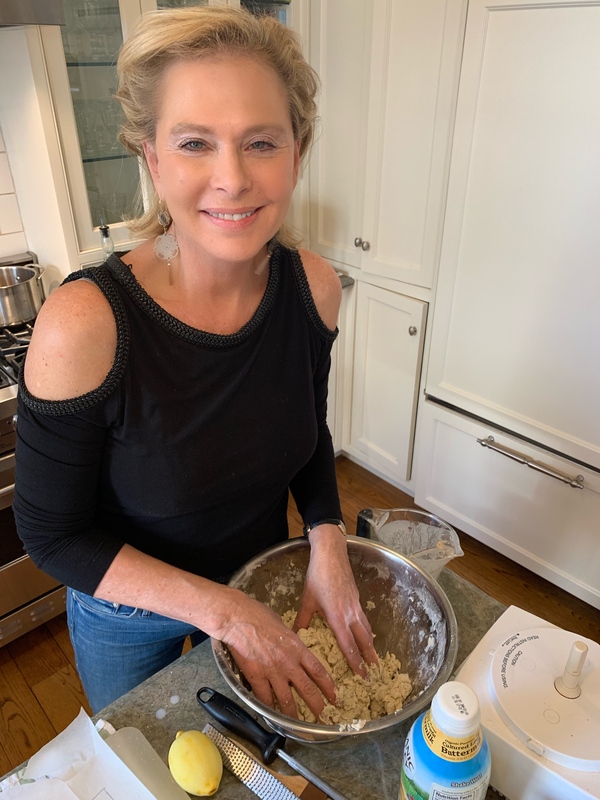 For me, singing and dancing have always been my true loves, right next to the joys of cooking! I’ve decided that 2019 is going to be the year of reinvention for me. Can a YouTube chef bring it live and direct? Can a seasoned hostess command the room? Oh, you know what they say, life begins at the end of your comfort zone! I originally came to New York years ago riding on dreams of being a singer and dancer. While my love for cooking took center stage, I can’t wait to now pour my heart and soul into this performance. Save the date ~ Tuesday, April 16th at 7PM. I hope you’ll come to see my show and share it all with me. Mark Nadler — a friend and multitalented cabaret performer, actor and comedic pianist — will be directing my show along with musical director Gregory Toroian and a special surprise guest. The show will be held at the Laurie Beechman Theatre. Seats are limited so get your tickets here while you can! A Cabaret Chez Chef: In the Kitchen with Mark Nadler and His Famous Pot Pie. 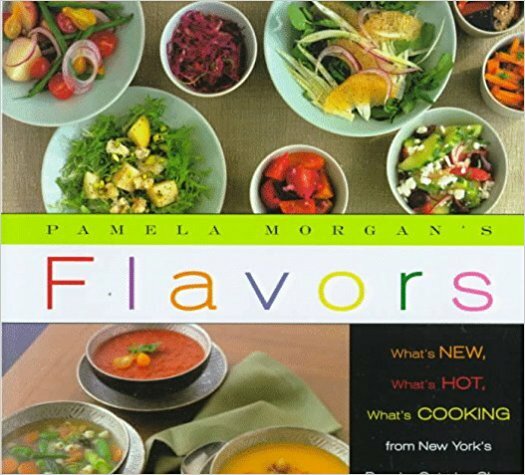 Opening Credits: When my show producer Mark and I were getting to know each other, I discovered we both had the same passion for cooking. One evening I had the pleasure of eating Mark’s famous pot pie at his home. After some well-deserved flattery, he promised he would come into my kitchen sometime and show me the ropes. Let me tell you, this pot pie is a labor of love. Between the creamy sherry-spiked velouté, cranberry relish and hearty filling, you’ll be hooked on this recipe for years to come. P.S. – This recipe requires much preparation time, but like anything, (even the long wait until my own cabaret show!) it’s well worth it. P.P.S. 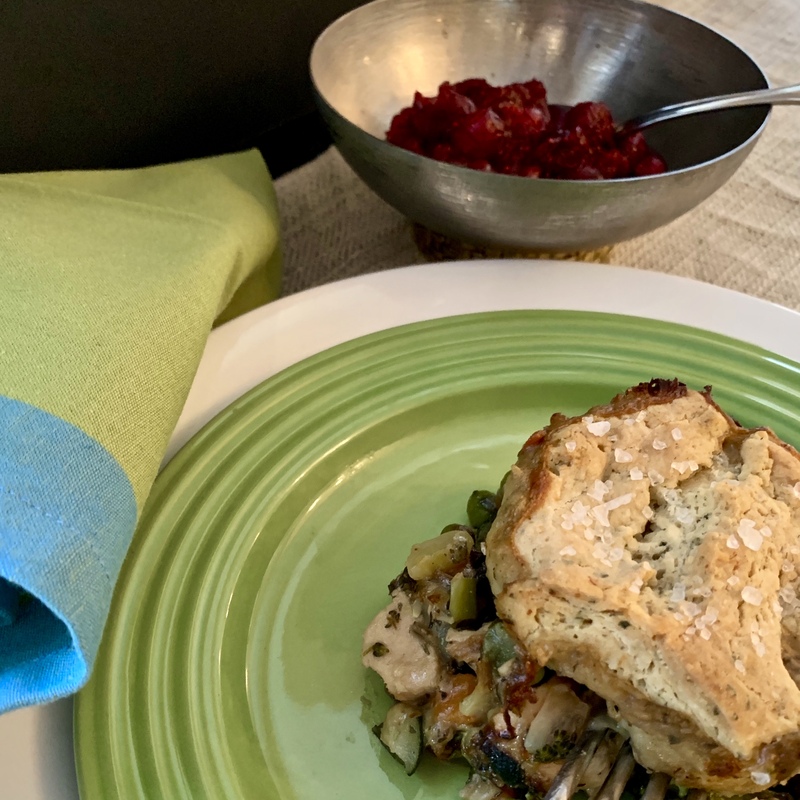 – Mark and I cannot claim that making his famous pot pie will make you famous, but it definitely will answer to your cravings. Easy Tip #1: You can use store-bought puff pastry to make things easier on yourself. Place a sheet of puff pastry over the top of the filling, pressing lightly around the rim. Brush the pastry with an egg and water mixture. Bake until the pastry is puffed and golden brown. Easy Tip #2: You can also make personal pot pies with this recipe. Just make sure you don’t fill the ramekins all the way to the top or else the filling will end up bubbling over the puff pastry. 1. 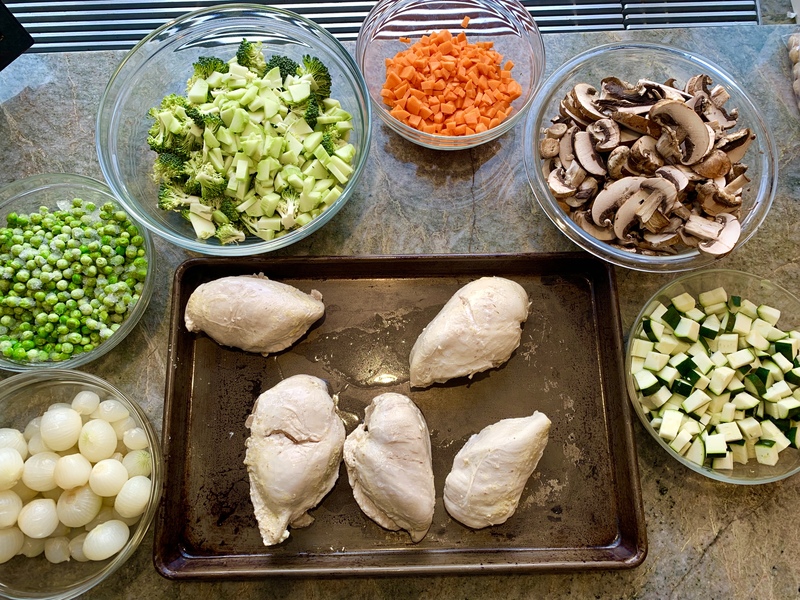 Add the chicken to a saucepan that’s large enough to hold all four breasts in a single layer. Cover with the chicken stock and bring to a simmer over medium-high heat. Cover and reduce heat to low and continue cooking until just cooked through, about 20-25 minutes. Test for doneness by cutting into the chicken at about 15 minutes. 2. Meanwhile, prep your vegetables by cutting them into bite-sized pieces. Do not combine them all into the same bowl as they will have different cooking times. Begin with the broccoli, by removing the florets from the large stem, but do not discard. Cut the florets down, if needed, so they’re no more than about 1-inch pieces. With a vegetable peeler or pairing knife, remove the woody parts of the stem to expose the light green, softer part. Then cut those down into small ¼-inch cubes. 3. Peel the carrots and cut up into ¼-inch cubes. Cut the zucchini into ½-inch cubes. Slice the mushrooms about ¼-inch slices or less. They will shrink in the process, and they’ll soak up the flavors they’re cooked with, so you don’t want to slice them too small. 4. When the chicken is cooked through, remove the breasts and place onto a sheet tray to cool while you prepare the biscuit crust. Reserve the poaching liquid for the velouté. 1. On a flat surface, roll out a large piece of parchment paper, at least 16” long. Using a ruler and a dark marker, like a sharpie, measure out a 14” x 10” rectangle. You may want to use the edge of the parchment box as a guide for your ruler, to be sure it remains straight. Flip the paper so that your dough doesn’t wind up with marker in it. You should still be able to see the markings through the paper. 3. Remove your butter from the refrigerator and using a sharp knife or bench scraper, cut the butter into small cubes and toss into the food processor immediately. Don’t want to handle it much as it will melt the butter and impact the flakiness of your pastry. 4. Pulse the mixture to break up the butter and coat the flour. Watch as you’re pulsing to make sure that you wind up with coarse crumbs and no large chunks of butter. 5. Dump into a large bowl and add the cold buttermilk starting with ½ cup and then adding the rest, as needed, ¼ cup at a time. Combine with your hands, or a spatula, and stir to moisten all ingredients. The dough should be soft and moist, just holding together. Don’t overmix or press it onto the sides of the bowl. 6. 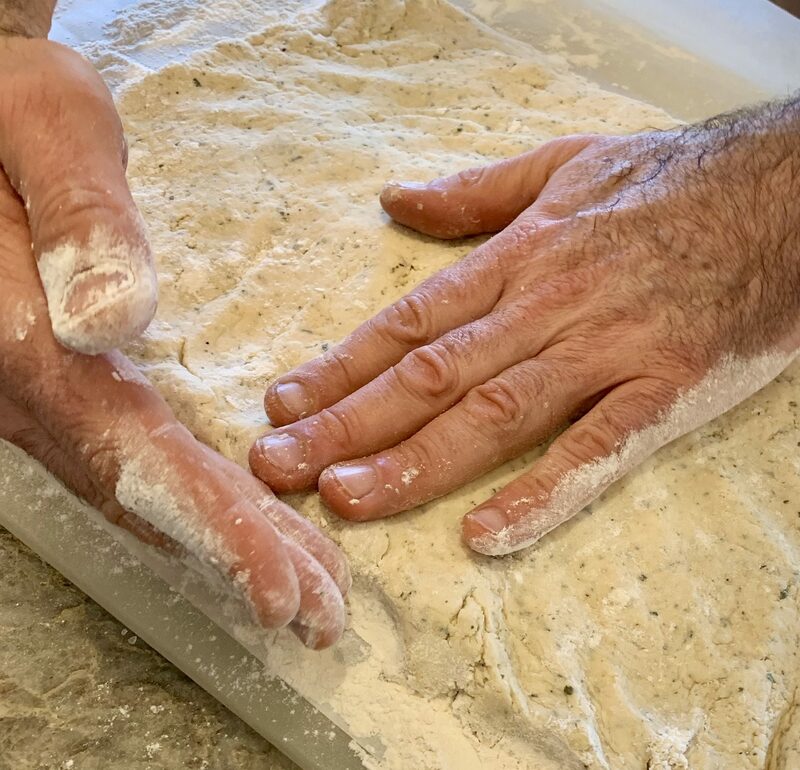 Generously flour your marked parchment paper and roll your dough out on the center of the rectangle. Using your hands, pat the dough out to fill the rectangle, making sure that it’s evenly distributed throughout. 7. Spread about half of the room temperature butter on top of the dough with a butter knife or spreader. Then fold the dough—using your bench scraper, with the help of the parchment paper. Fold it as you would a letter, one third on top of the other. Take your new rectangle of dough, rotate it 90 degrees and repeat—patting the dough into the rectangle, covering with remaining room temperature butter and then folding the same way. 8. Once more, flatten the dough out to your rectangle. Cover it in plastic wrap and chill in the refrigerator while you finish preparing the filling. 5. In a large sauté pan, heat about a tablespoon of olive oil over a medium-high heat and add broccoli and carrots when shimmering. Cook, for about 5-7 minutes, stirring frequently, until they’re crisp tender. When done, they should go into a very large mixing bowl. 6. Meanwhile, in the same saucepan used for poaching, add 1 tablespoon olive oil and heat over medium. Add mushrooms, salt, fennel, tarragon, and thyme. Cooking down so that the mushrooms absorb those flavors. About 6-8 minutes. 7. Add remaining olive oil to the sauté pan used for broccoli and carrots, and heat over medium. Add the zucchini and cook down so that liquid escapes the vegetables and evaporates. About 5 minutes. 8. Remove the mushrooms from heat and add sherry or madeira to the pan. Lower the heat on the stove and continue cooking. Add cooked zucchini and cook down until the alcohol has evaporated another 3-5 minutes or so. 9. Add the onions and peas to the broccoli and carrots. Turn off the heat and let the mushroom mixture cool. Cut the chicken breasts into bite-sized pieces, about 1-inch cubes and add to vegetables. Then add the mushrooms and zucchini to bowl. 1. 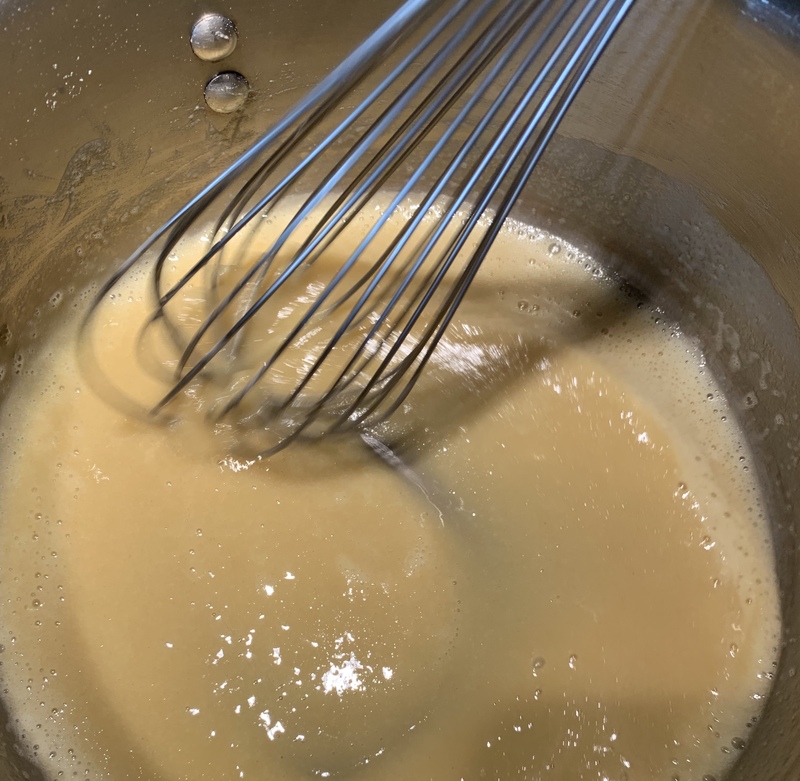 For the velouté, start by making a blonde roux. Melt the butter in a clean large sauté pan over medium heat. When butter is melted, add flour slowly while whisking vigorously to remove and chunks. Cook until you have a Dijon-mustard-like color, not brown. As you continue to whisk, stir in the chicken stock and add 3 healthy pinches of salt. The velouté should be a silky texture that coats the side of the pan and shows the tracks of your whisk. 2. Add 3 hearty dashes of hot sauce, Dijon mustard, and black pepper and stir. Then pour/scrape into your large mixing bowl with the chicken and vegetables. 1. Mix all ingredients together so that every piece is covered with sauce. Taste and adjust seasoning if needed. Once ready, pour mixture into your baking dish and remove the pie crust from the fridge. 2. Top the dish with the biscuit dough and use a pastry brush to coat the top with the melted butter. Sprinkle with finishing salt and put into the center of the oven. Bake for about 20-40 minutes, depending on the true temperature of your oven. Check at 20 minutes and continue to cook in 10-minute increments until the biscuit dough has risen and is golden brown. Serve with cranberry relish. 1. For the cranberry relish, combine the cranberries, sugar, brandy, and cinnamon in a small saucepan over medium-high heat. Zest the orange into cranberries. For easy removal of the cloves, stick them into half of the orange and drop into relish. When the sugar has melted and the alcohol has evaporated, remove the orange and the cinnamon and serve with the pot pie. Can be served warm or room temperature. 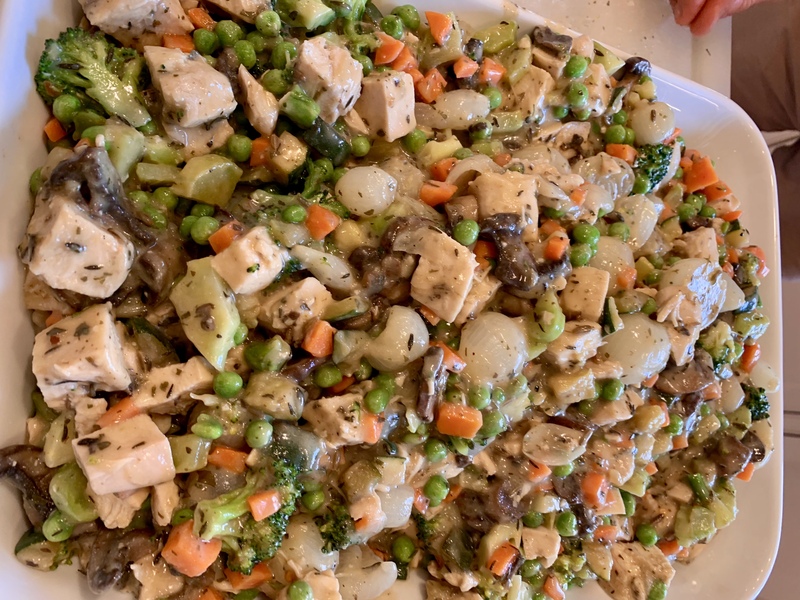 I hope you love this chicken pot pie as much as we did. Have fun with it! I can’t wait to see you at my show this April. Click here for tickets!